News: Datamark UK Recommend Versawipes – To Help Reduce the cost of premature printhead failure and reduce expensive downtime with the industry’s most versatile printhead cleaning wipes. The printhead is the most critical component of your printer and one of the most delicate and expensive. Most print quality problems are a direct result of improper care of the printhead. A consumable that wears over time, much like the brakes on your car, requires proper installation and on-going maintenance to ensure a long life of service for your printer. Printer manufacturers recommend regular cleaning of the printhead to remove any build up of residue caused by label dust, adhesive and dirt in the atmosphere. This build up of residue will, over time, become baked onto the printhead. This will then interfere with heat transfer, causing the heater elements to overheat to the point of failure. Datamark UK recommend the use of Versawipes to keep your thermal print heads, platen rollers and label sensors clean and healthy. With a single product you can keep your thermal printheads in first class condition, whilst maintaining a clean and healthy localised working environment. 100 easy to use wipes in each container for convenient storage right next to your printer. The container allows for easy access to the wipes without any wasteful individual sachets. 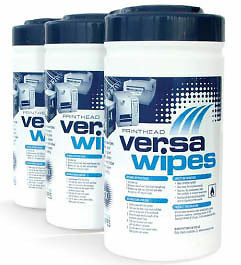 Unlike other print head cleaners such as ribbon attachments, pens and sachets, Versawipes will enable you to keep all parts of the printer and surrounding print area clean and healthy. A single versatile product for the complete job.